I am such a Sam Fine groupie. His book, Fine Beauty, stays in my bathroom....covered in dusty, powder foundation fingerprints...and dog-eared on certain pages. I LIVE for his vision of beauty. I mean live for him. He is my makeup idol. So when I heard that he was the new creative director for the classic line, Fashion Fair, I was really geeked. 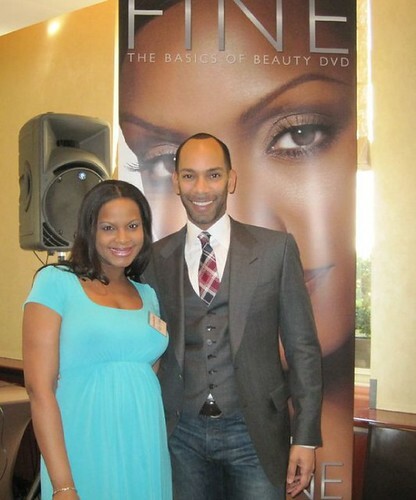 Fashion Fair was undoubtedly one of the first makeup lines of color. Founded by Ebony/Jet co-founder Eunice Johnson it is an iconic line in the black community. I remember turning 16 and my mother finally let me wear FULL on makeup: foundation, shadows, etc. We took a little trip down to Rich's Department Store in South Dekalb Mall, and I got a makeover from a Fashion Fair consultant. I wore "Mocha" foundation and "Brown Sugar" lipstick (Oh...I remember!) You couldn't tell me nothing when I was 16, carrying my pink compacts and touching up in between class in the school halls. Granted, my penchant for Fashion Fair faded as the years grew. The foundations weren't doing it for me...and companies like MAC, Bobby Brown and other mainstream folks started to cater to us brownie gals. Not to mention, IMAN came out with her collection and I was HOOKED from the jump. But Sam has decided to now take the helm of Fashion Fair and I was so excited to see the iconic line get a much needed revamp. 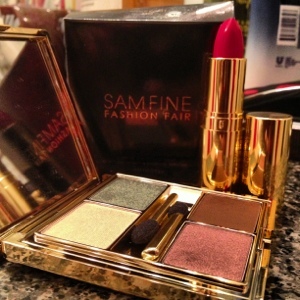 Sam def wants to appeal to a younger clientele who wants vibrant and bold high pigmented shadows and lipsticks. The week of the launch, I ran to my nearest Macy's and tried out all the shades. and I do mean ALL of them. I loved them all but couldn't decide. I settled on the Amalfi Coast pallet (the more neutral of the two) and the Dynasty Red lipstick (because Red lips are kinda my thing). I tried them on when I went out later that night on the town w/ my beau!! That red lasted almost all night and hardly faded. The shadows really popped on me. I did add a little Urban Decay"Foxy" shadow under my brow...but otherwise..it was all FF on the eyes. The blush and foundations were IMAN however. I can't wait until Sam launches some more to the line. I am sure he will add foundations, blushes, and other things. I mean I was so geeked. If he brings out reformulated powders and foundations, I may have to leap right back to Fashion Fair. Besides..supporting a black business is kinda important. So what do you dolls and beaus think??? I really love that red on you! Im glad Sam Fine is revamping Fashion Fair - it sorely needs it!